It probably comes as no surprise that I’m into juicing. I mean juicing like kale smoothies, not like steroids, of course. Ah, juice: $7 cups of raw goodness that pick you up without a caffeine crash later. Heaven! Well, heaven for Gwyneth Paltrow and the GOOP co., maybe. I don’t know about you, but I don’t have the funds for a $7/day juice habit! In a perfect world, yes, I could endlessly patronize my local juiceries, but I had to find a more practical way of incorporating this healthy habit into my lifestyle. Enter, the Jack LaLanne juicer. I’ve linked to the one I actually own, but other choices can be found here, here, here, and here. Funny story—I have been gifted 2 identical Jack LaLanne Power Juicers in my life! The first one came many moons ago from the grandfather of an ex-boyfriend (random), and the second came last year when a thoughtful coworker noticed that I was into healthy eating. I can certainly understand the impulse to ditch your juicer: they’re bulky, they take up valuable cabinet space, and they come with a million parts, all of which need to be cleaned with every use. It’s annoying! 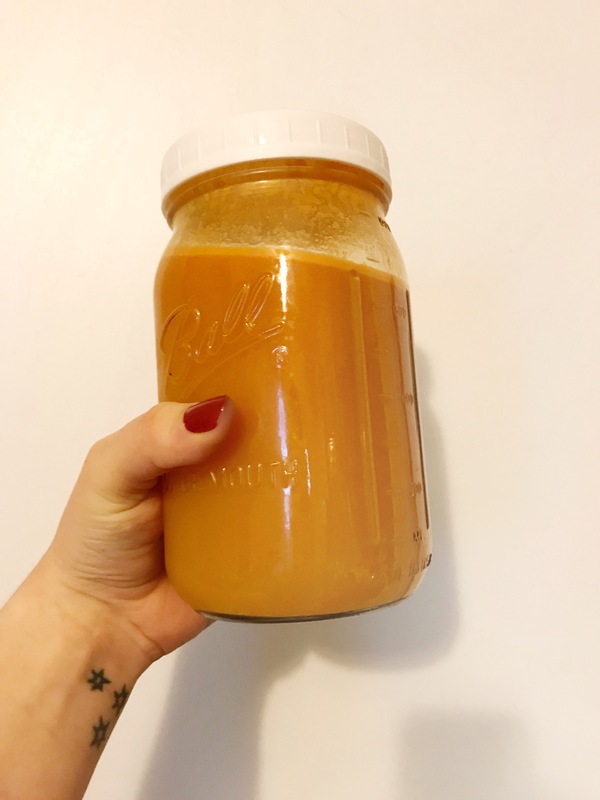 However, the five minutes you’ll spend washing your juicer is, in my opinion, worth saving the $5-$10 you’ll spend on a takeout juice, especially since you can make as much as you want at once. I just made a quart of the stuff! 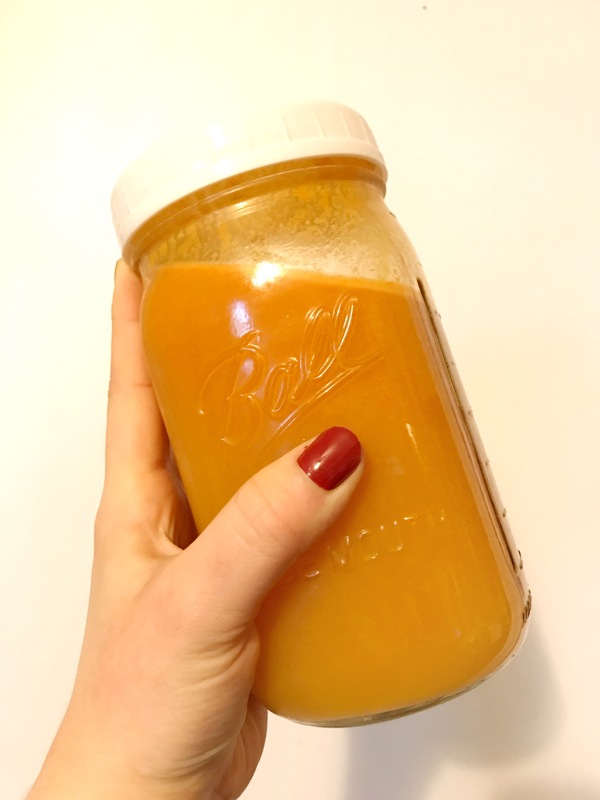 For the longest time I kept meaning to juice, but felt overwhelmed at concocting a recipe. What, for instance, can be juiced? If I throw all of the produce in my fridge into the machine, will it taste disgusting? As it turns out—everything and no! So, here’s my foolproof recipe, my “everything but the kitchen sink” juice that is as delicious as it is nutritious! Wash and prep all of your fruits and veggies. Shove them down the juicer chute to extract juice. Pour into a quart mason jar or pitcher and top off with filtered water. Give it a shake and serve right away! I like to save my leftovers for the next morning, because what kind of psychopath gets up early enough to juice before work? Not me. Alternate preparation if you don’t have a juicer: combine all ingredients (including filtered water) in a high speed blender until liquefied. Strain the pulp out with a nut milk bag. *very Stefon voice* This juice has everything: Vitamin A, Vitamin C, Vitamin K, B vitamins, folate, potassium, manganese, anti-inflammatory agents, Vitamin E, and calcium! If it were any healthier, I might have to ditch my one true love, coffee, in the mornings! But don’t worry, coffee, that will never happen. I’ve found the trick to delicious juice every time is the addition of citrus and ginger. Apart from the health benefits they each bring to the table, they make anything taste delicious. For instance, I despise raw celery with a passion, but I’m out here tryna get that Vitamin K! P.S. The next National Cabbage Day is February 17, 2018. If our current administration hasn’t destroyed the planet in nuclear war by then, see you there!